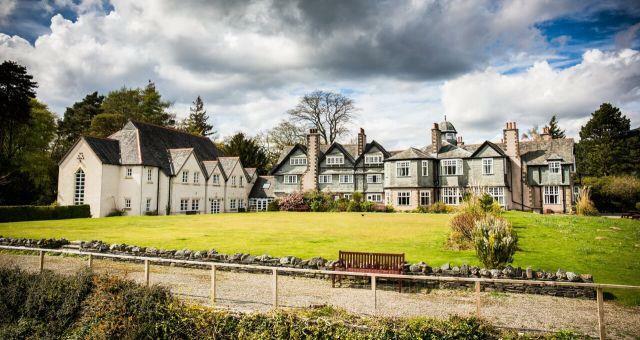 Derwent Hill017687 72005work017687 75422faxBed & BreakfastDerwent Hill is in a world class location occupying a beautiful 28 acre estate bordered by the River Derwent overlooking Derwent Water. We are just one mile from Keswick where you will find shops, cafés, pubs, restaurants and a theatre. We are also just a few minutes walk from a hotel bar and restaurant, café and pub. Derwent Hill has two adjoining facilities on the same site, offering a range of accommodation. Our Training Centre offers 15 en-suite single/twin/double rooms complete with TV, wifi and complimentary tea and coffee. Our Education Centre has 8 private en-suite dormitories and 6 single/twin en-suite rooms. The whole centre can be booked out as a group or individually on selected dates. Please contact us to find out more. During your bed and breakfast stay enjoy a comfortable night’s sleep, followed by a full English breakfast, before venturing out to enjoy the wonderful English Lake District World Heritage Site. Your stay includes the use of a comfortable lounge with complimentary tea and coffee, so you can relax and unwind at the end of the day. Derwent Hill is owned and operated by Sunderland City Council in a fantastic setting in the English Lake District – a National Heritage Site. It was one of the first Local Authority Outdoor Education Centres in England and has been in operation since 1962. The centre has grown since then and we now provide a wide range of services, but our core purpose is still the same: to provide high quality residential outdoor education for the children and young people of Sunderland, which includes some of the most deprived areas in the country. The income we generate from other work is used to keep down the costs of courses for schools and youth groups. We operate year-round and employ about 30 staff. We look forward to welcoming you to Derwent Hill. Derwent Hill sometimes limits bookings to 2 or more days. Derwent Hill is in a world class location occupying a beautiful 28 acre estate bordered by the River Derwent overlooking Derwent Water. We are just one mile from Keswick where you will find shops, cafés, pubs, restaurants and a theatre. We are also just a few minutes walk from a hotel bar and restaurant, café and pub. By Car: From M6 junction 40 at Penrith take the A66 west for 17 miles past Keswick to a large roundabout. Continue on the A66 and take the second turn left (signposted Grange, Portinscale). After 600m, turn left where the road swings sharply to the right. Derwent Hill is on the right after 100m, beyond the Derwentwater Hotel. By Train and Bus- Keswick is served by hourly buses from rail stations at Penrith, Windermere and Workington. From Keswick you can walk or take a taxi – we can pick up groups by prior arrangement. On Foot: Derwent Hill is 1 mile from Keswick. From the bus station, go left along the side of the supermarket to a mini-roundabout and turn left. After 300m turn left immediately after crossing the river, then turn right onto a surfaced footpath. Follow this across the fields to a lane, turn left and cross the footbridge. Derwent Hill’s gate is 100m further on the left.